Rouvier Patrimoine: created in 1991, this diversified bond fund is intended for investors favouring investments that have low levels of exposure to equity market fluctuations. Its aim is to generate performance above those of 2-year to 3-year euro zone government bonds whilst ensuring low volatility (approximately 3% since launch). 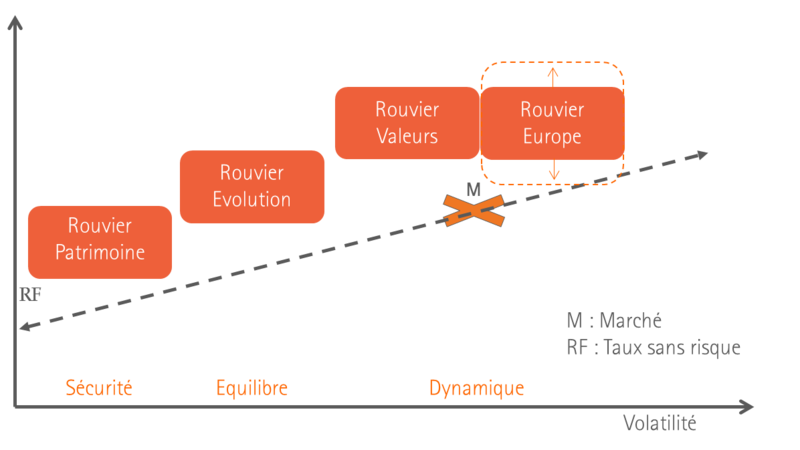 Rouvier Evolution: launched in 2012, this fund seeks to generate, over a time-frame of at least five years, a combination of risk and return that is better than that of the main global indices. Rouvier Valeurs: created in 1991, its aim is to generate positive absolute performance over the long term (minimum of 5 years), by capturing company earnings growth or benefiting from a market rerating of securities. Rouvier Europe (PEA eligible): created in 2003, this fund is exclusively invested in European stocks with the aim of producing, over the long term, an average annual performance that is greater than that of its benchmark index. A service offering bespoke management of the funds invested by your clients, delegated management is carried out mainly through a selection of funds (multi-manager).